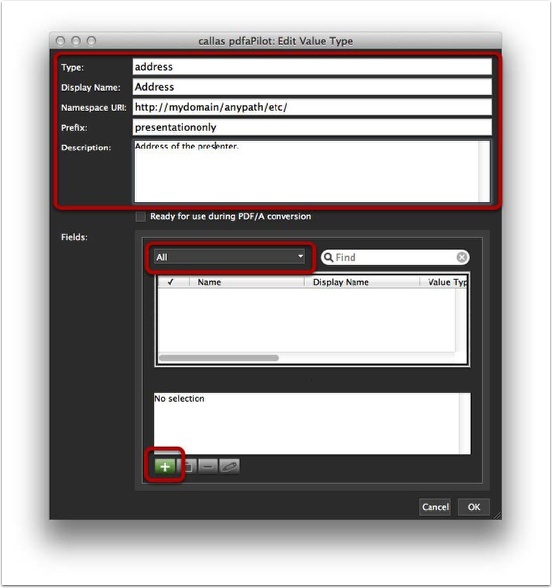 If a user wants to add custom metadata to a PDF/A file, an extension schema is required that covers this custom property. 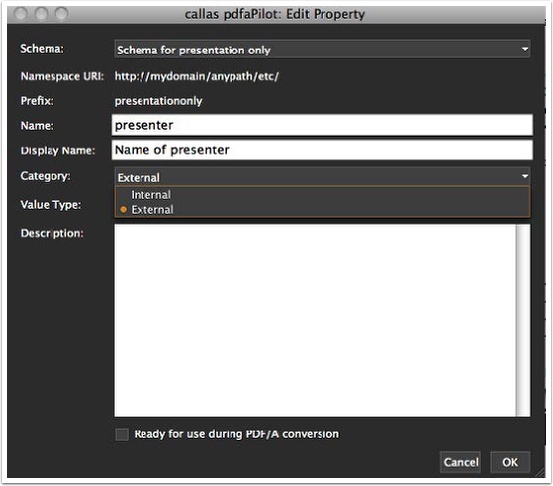 callas pdfaPilot comes with its own XMP Extension schema editor, which can be accessed via the action "Extension schema editor" in the "Metadata" section in the Switchboard. 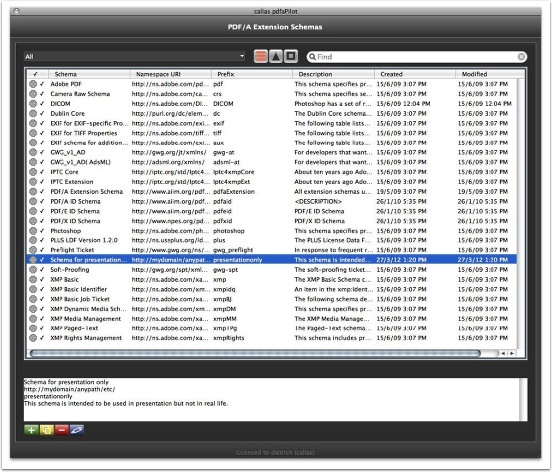 Here you can have a look at predefined schemas, data fields and value types or create your own to be embedded during conversion to PDF/A. 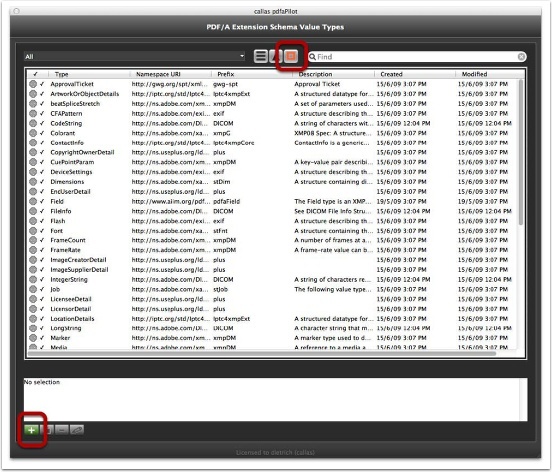 You can also capture properties which are present in the document metadata. 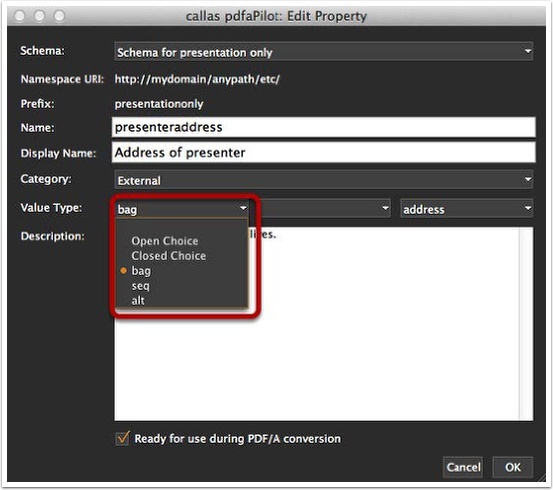 Open the Extension Schema Editor in callas pdfaPIlot. A Schema is a container for an arbitrary number of properties. 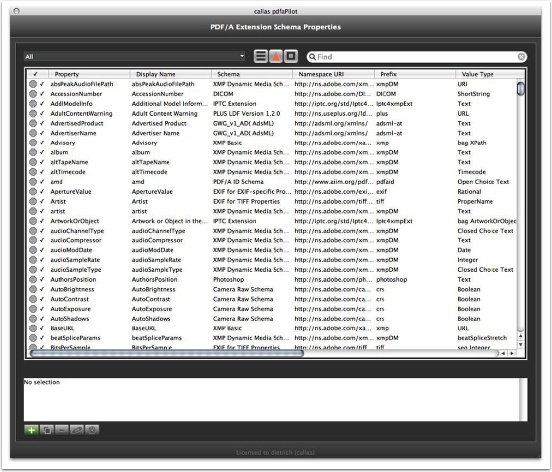 First you will have to create your own schema that will later take your properties. 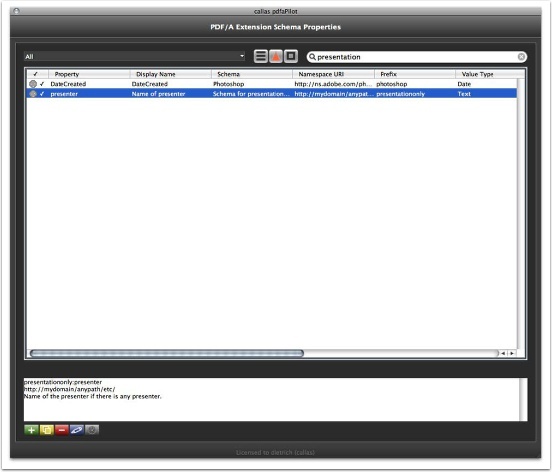 Click on the left of the three icons on top of the list in order to switch to the list of Extension Schemas. Then click on the green [+] icon at the bottom of the window. 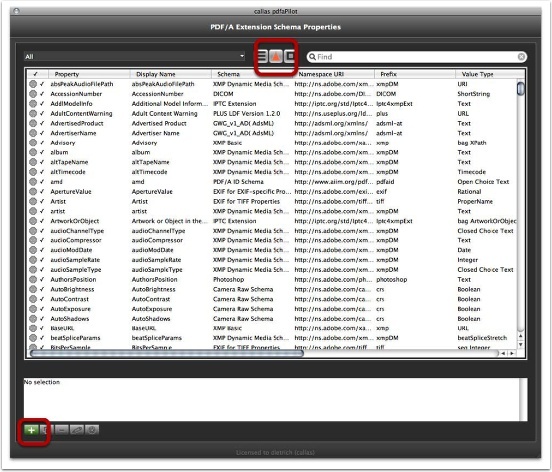 A new window opens that lets you define your schema. 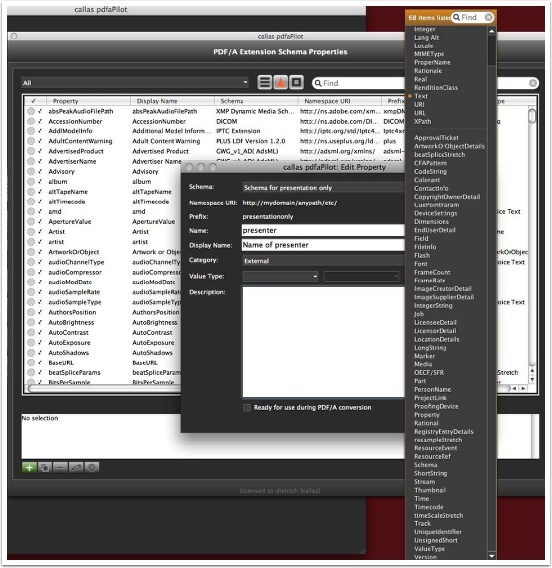 The namespace URI is intended to be a unique string so that the schema can be identified. Therefore it is common practice to use a domain name that belongs to the organisation which is defining the Extension Schema. That reduces the propability does another organisation would use the same namespace. Note that it is neither required nor recommended that the namespace URI is in fact a website. Click on the middle icon above the list of Extension Schemas in order to switch to the list of properties. Click at the green [+] icon in order to create a new property. Note: The category defines whether it is user data (External) or rather technical internal information (Internal). 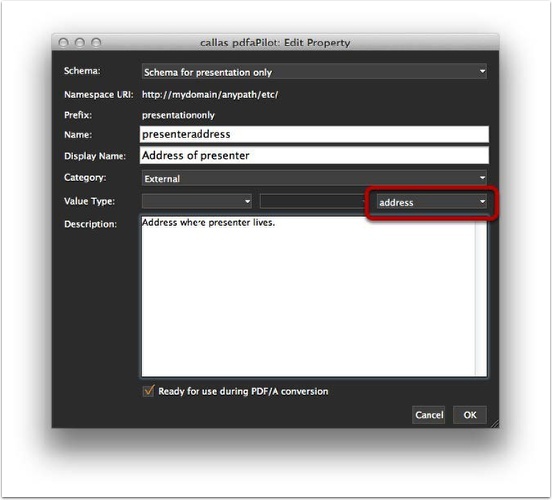 callas pdfaPilot lets you even define your own structured value types, .e.g in order to save machine data or an address (consisting of a name, a street, a city etc.). In order to define your own types you will have to use the right icon above the list of properties. Any type you will define there can be selected here. This is, however, not described in this document. 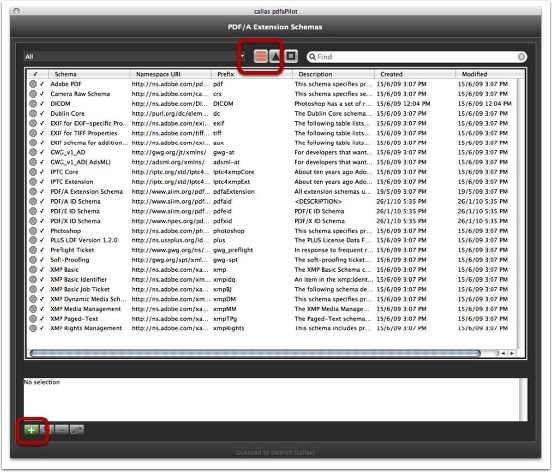 You can now use the Metadata fields in a PDF file and pdfaPilot will automatically embed the Extension Schema for all entries that show up in a PDF file when it is converted to PDF/A. 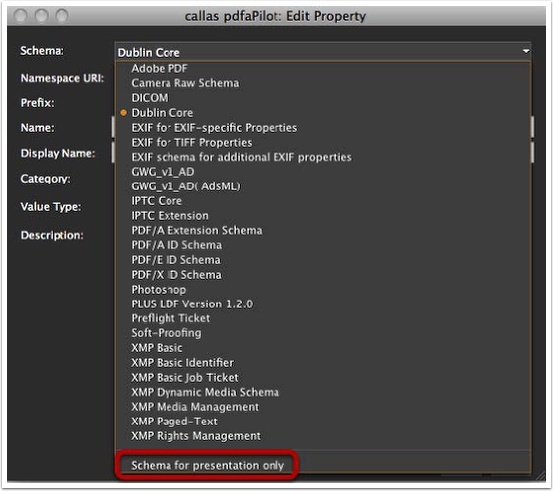 But you can even define your own data types or structures in XMP, read below how you can do that with pdfaPilot. Fill out the first rows with proper values. 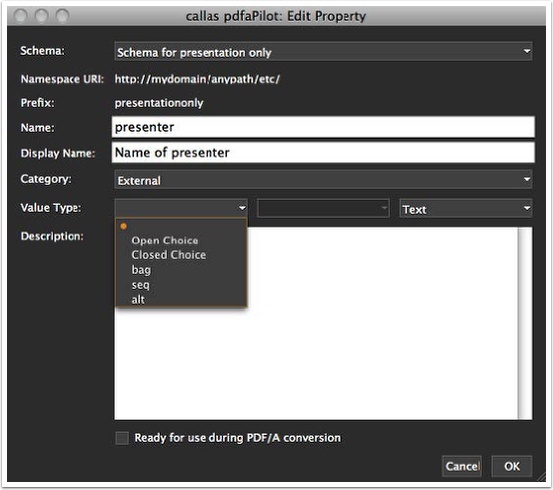 Lets create a value type for the address of the presenter. The address should consist of three properties. Click on the + in order to add field to the address type. You may also use the Pop-Up in order to add an existing field. 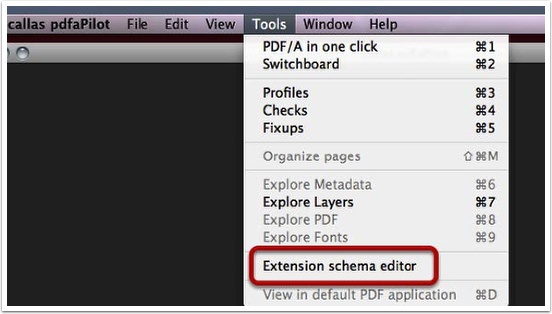 Created extension schemas are stored in your pdfaPilot user folder within "PDFAExtSchema/Custom.pdfaschema". These can be used in the CLI/Server version by copying the file to the appropriate folder (e.g. 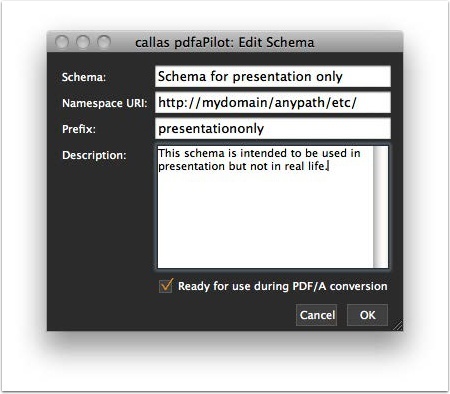 "/.callas software gmbh/callas pdfaPilot <version>/PDFAExtSchema" on Unix).